Barska® 1.25-4.5x26 mm Euro-30 Rifle Scope helps you take down moving targets like a pro! Wide field-of-view and parallax-free design (at 100 yds.) make this Scope perfect for quickly scanning and aiming at targets on the move. Built to last for generations, this Scope is 100% waterproof, shockproof, and fogproof. The T6 aluminum-constructed monotube makes it a great choice for high-recoil weapons. Measures 11"l. Weighs 15 ozs. 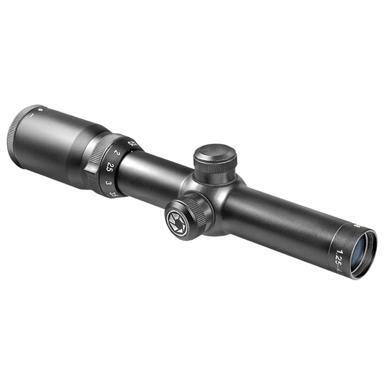 Barska 1.25-4.5x26 mm Euro-30 Rifle Scope is rated 4.3 out of 5 by 3. Rated 5 out of 5 by Misterbusha from Good value My only very slight complaint would be that The horizontal and lower crosshairs are kinda thick, and actually blocks out some of the sight picture. It came with decent rings, but they were too tall for my liking. Rated 3 out of 5 by Bill from Focus ring scope would not focus above 2 power after it had been in use for approx 2 boxes of shells through a .444 timber carbine. Rated 5 out of 5 by THOMAS from This optic is built very well. I will be running it through heavy use during the next few months. The Rings are included but they are only acceptable and I would recommend a more solid mounting solution. Overall a Good product.